A native to Austin, Shannon currently lives in Tucson, Arizona. She recently received her Bachelors degree in Fine Arts from the University of Arizona and has had several of her sculptures exhibited in Tucson, where she hopes to continue her metal work. Fortunately for BCRC, she decided to extend her artistic talents to this year’s show. She thought long and hard about the woman who would come to wear her art bra, and imagined a woman who was incredibly strong and extraordinarily beautiful. She then began to think about the Art Bra Austin event, itself, and of the fun and hope the event brings to so many of the BCRC clients. And thus, the idea of “Mardi Gras Madness” was born! Shannon’s beautiful art bra is inspired by Mardi Gras as a great celebration of life – full of wonderful colors, beauty, people connecting with each other, and the energy one feels when joined with so many other people. 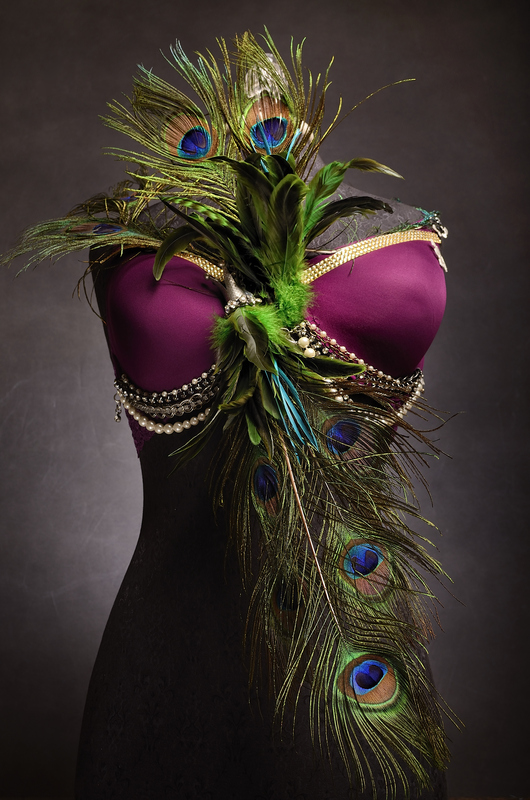 The art bra’s purple, gold, and green colors represent the traditional colors of the annual Carnival celebration. Its vibrant peacock colors symbolize the natural beauty found in nature. As a final touch, the gold rhinestones, chains and crown adorning the bra are merely extensions of the regal and perfect beauty found inside all strong women. Simply put, this art bra celebrates a woman who has been met with a daunting challenge and has come out of it strong and beautiful – an outcome certainly worth celebrating. Shannon dedicates this bra to her grandmother, Caroline Robinson, a strong, southern woman who passed away from cancer but left her family with a lifetime of love and memories.